Rabbits have quite the back leg strength and are well-known for their hopping ability. But just like other animals, sometimes things can happen that can cause a rabbit to start limping. Your rabbit may suddenly start to limp if they have fractured (broken) their leg. This may be an obvious reason for limping in rabbits but it is also a very serious one. Rabbits can jump off of high surfaces or out of your arms while holding them and land too hard on their legs causing a fracture. This is a common occurrence with small children who try to carry their rabbits. The rabbit may struggle and fall or jump and land incorrectly causing a fractured leg. If you suspect your rabbit has broken their leg get them to the exotics vet as soon as possible for treatment. Another reason a fracture could occur is from your rabbit's leg getting stuck in something like their cage bars. Hay hoppers and inappropriately sized cage bar spacing are the usual culprits as are ramps in their cages and floor vents in your home. Make sure your rabbit's leg cannot slip into or through any of these items that are in their environment. More commonly known as "Bumblefoot", pododermatitis is a foot infection that can occur in rabbits (and rats). This type of problem can be very painful and cause your rabbit to limp. You will notice redness, sores, hair loss and perhaps even scabbing or oozing on their feet or hocks (ankles). Bumblefoot in rabbits can be caused by a number of factors. Some reasons for bumblefoot include your rabbit being overweight and putting too much pressure on their feet and hocks which causes sores that subsequently become infected, dirty environments that cause persistent moisture on the feet and hocks, rough surfaces like metal wires that your rabbit has no relief from, your rabbit sitting in their dirty litterbox for extended amounts of time, and sedentary rabbits that sit for prolonged periods of time without much exercise. Bumblefoot can be treated in a variety of ways depending on the severity of it but it usually involves antibiotics, pain medications and correcting the reason for the problem. While not the reason anyone wants to hear, sometimes rabbits limp because of a tumor. Bone cancers are sometimes seen in rabbits and are very painful, which causes a rabbit to limp. 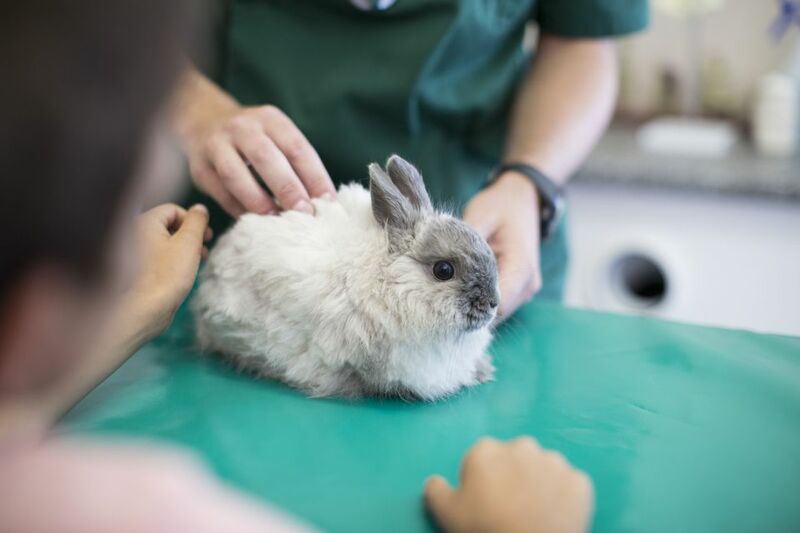 If you notice any type of swelling or lump on your rabbit do not hesitate to make an appointment with your exotics vet to find out what it may be. If it is a tumor it may need to be surgically removed. Sometimes leg amputations need to be performed to completely remove the tumor if it is cancerous. Rabbits are particularly prone to abscesses. Abscesses seem to pop up anywhere on a rabbit and can be very difficult to get rid of. They can also become large enough to cause discomfort to your rabbit and if located on their leg, cause limping. Abscesses are pus-filled lumps that are treated by lancing them (cutting them open), with antibiotics, pain medications, and sometimes even with surgical debridement or removal. Just like a tumor, if you notice any type of lump on your rabbit be sure to have your exotics vet examine it to determine how to treat it. Known commonly as arthritis, osteoarthritis is the inflammation of the joints and can affect rabbits just like it can affect us, our dogs, and other pets. Arthritis usually occurs in older rabbits and can cause limping. Both front legs and hind legs can be affected by arthritis and it is also important to remember that any joint can be bothered by it. Arthritis does not just isolate itself to elbows and knees as many people often think but rather it can be found in the carpus (wrist), hock (ankle), hip joint and even in any of the many joints of the feet and toes. Radiographs (x-rays) are used to diagnose arthritis in rabbits. Unfortunately, there is no way to undo arthritis but there is a way to treat the pain and inflammation that it may cause. Different medications and supplements may be prescribed or recommended by your exotics vet but it is important to discuss any of these items with them prior to attempting to medicate your rabbit. Some long-term medications and dosages may be harmful to a rabbit with their sensitive gastrointestinal tracts. There are no drugs specifically labeled or designed for long-term arthritis treatment in rabbits so it is most likely that anything you use will be off-label usage. Diets and supplements with added ingredients are also available for rabbits with arthritis. These items are designed for aiding in the treatment of osteoarthritis in rabbits but may not be enough by themselves to completely resolve the limping. Omega fatty acids, glucosamine, turmeric and other natural ingredients may help your rabbit feel better and prevent further joint problems in the future. If your rabbit spends time on rough surfaces they may grind their nails down naturally but most pet rabbits require regular nail trims. If a rabbit goes too long without a nail trim the nails will continue to grow and sometimes grow into the pad of the foot or break off at the quick and cause pain or discomfort. If your rabbit's nail has curled into their foot pad, the long nail will need to be trimmed and removed from the pad. It will most likely bleed and your rabbit may need antibiotics, pain medications, and perhaps even a bandage. If the nails are simply too long they may snag on carpeting or in the cage, tear off, and cause bleeding. These can usually be managed at home if you have styptic powder but if your rabbit is in too much discomfort they may appreciate pain medications. Make sure that regardless of the nail injury your rabbit's feet stay clean. Dirty feet will cause the nail injury location to get infected. Joints can become dislocated in rabbits like they can other animals and people. When a joint "pops out of place" it is called a dislocation and sometimes it needs help going back into place. If a joint is dislocated (such as the hip or knee joint) your rabbit may limp until it pops back into place. If a joint is dislocated for too long it cannot be replaced so do not wait to see what happens if you suspect your rabbit has a dislocation. Rabbits can injure their back by kicking too hard, being dropped, and with intervertebral disc disease (IVDD). Sometimes it is a chronic problem (with discs that bulge, become inflamed, and put pressure on the spinal cord) and other times it is an acute issue (from trauma) but regardless, spinal issues may cause your rabbit to limp and wobble. Spinal issues are serious in any species and your exotics vet should be consulted if you are worried about your rabbit's back. Radiographs and other imaging such as MRI or CT may be recommended to aid in diagnosis and steroids, pain medications and other drugs may be prescribed to treat your rabbit. Sprains, strains, and other soft tissue injuries may cause your rabbit to limp. A fracture or dislocation may outwardly look similar to a soft tissue injury but surgery is not needed. Anti-inflammatory and pain medications are usually prescribed along with rest but thankfully soft tissue injuries usually self-correct over time (unless a ligament or tendon is torn which will require an MRI or CT scan to diagnose).